SIGN UPS ARE OPEN FOR OUR CLASS WITH CHRISTA WATSON! It's finally time to sign up for our fall class with Christa Watson! This will be a full day of sewing and learning on October 8. For more info about the class, click here. Please click below to purchase your spot in our class with Christa Watson. **Reminder** Sign ups are currently open to anyone. 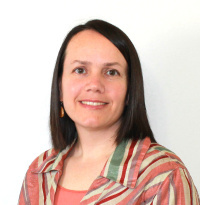 Announcing our Fall class with Christa Watson! We are so excited to be able to bring Christa Watson to our guild to teach Modern Machine Quilting. 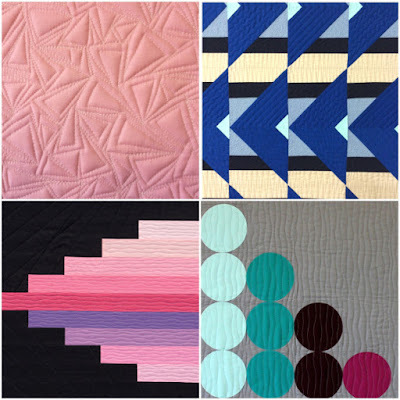 Take your modern quilts to the next level by adding depth and dimension to your designs. The secret is learning to let go of perfection by practicing over a dozen different asymmetrical textures that require little to no marking of the quilt.Students will utilize both free-motion and walking foot techniques by practicing on small practice samples or leftover quilt blocks. Students may bring in their tops for a discussion of possible quilting ideas. The class will be an all day event on October 8th, held at the West Newbury Old Town Hall in West Newbury, MA. (For those of you like me, that's the one that looks like a church between two farms.) We'll start at 10 a.m. (be sure to arrive around 9:30 to set up machines, grab snacks, and settle in), break for a catered lunch, and end at 5 p.m. We'll have the full day to practice new techniques on our machines so that at the end of the day you can go home with the ability to replicate what you've learned. 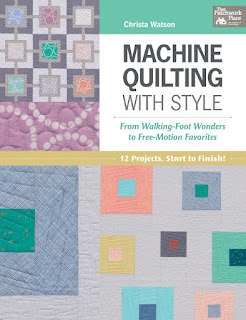 Christa's book, Machine Quilting with Style, will be required for this class. Sign ups for this class will open on July 15. There will be a PayPal button live on this blog at 8:00 a.m. I will send out an email to let you know that you may start to sign up. There are only 22 spots in this class and they will go first come, first serve. In the event that we do not fill those spots within the guild, we will open the remaining spots to non-members on August 15. We met at the Haverhill Library on Saturday to work on both the QuiltCon Charity quilt that will travel to Savannah in February, and some of the quilts for Orlando. We started with a very short business meeting. This Friday, July 15, at 8am the PayPal button will be posted on the blog for the Christa Watson class that we are hosting on October 8th from 10-5pm. The class will be on free motion quilting using your domestic machine. The class will cost $100. Starting July 15 the class registration will be open to only SMQG members and seats will be filled on a first come first serve basis. On August 15 any remaining spots will be open to the public. 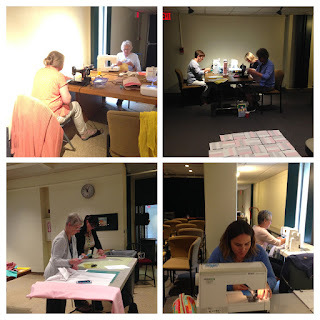 We will have an optional sew in on Friday July 22 at the Stratham Library from 2-8. If you would like to come bring something to work on and any accessories you need for sewing! We had a brief show and tell before we got down to sewing! Diane shared this quilt she made, with matching pillowcases! Carrie did the quilting on this quilt using her long arm. 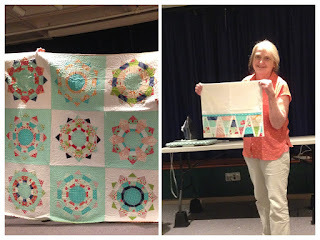 Nancy showed off her finished quilt top from Lori Holt's Farm Girl Vintage pattern. Alison secretly shared some blocks that she has been pattern testing for Tartan Kiwi, and also showed off this charity quilt that she whipped up and quilted on a long arm using rented long arm time. Our sew in was very productive, we made good progress on the QuiltCon Charity quilt, and also got a quilt top made from the Orlando heart blocks that we had all made at home. There was also some progress on assembling the quilt blocks that were signed at the Portsmouth Pride Parade. Our next meeting will be on Saturday, August 6th at 10am, at the Lane Memorial Library in Hampton. Bea will be teaching applique methods. A supply list will be posted in the meeting reminder.